Crazy cold temperature of -40F˚ last week; I hope everyone stayed safe and warm. This is the time of year that we all need to pay attention to eating well and washing hands to avoid getting sick. There are many healthy Japanese foods that keep us warm: Oden, Sukiyaki, Shabu-shabu, and other Nabe dish. “Nabe” dish is a typical Japanese dish that is very popular in the wintertime and very easy to make. Yosenabe (寄せ鍋), literally means “put-together pot”, this dish is cooked by all kinds of different ingredients cooked together in a miso or soy sauce based broth: meat, seafood, vegetables, tofu, and egg. It is a hearty meal that will keep you warm in the cold season. 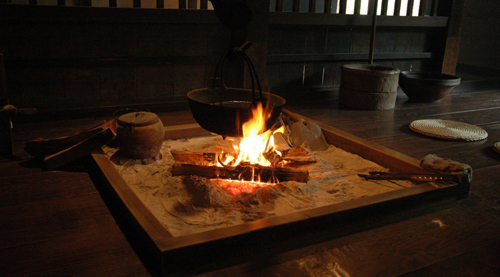 Long ago, a sunken fireplace called an “irori (囲炉裏)” was at the center of Japanese homes. Families would place a cast iron hot pot above the fire to cook their feed, eating from the pot while periodically adding new ingredients. This is thought to be where hot pot cuisine first originated. Time has passed and kitchens were added to the home, irori fireplaces largely disappeared, replaced with simpler shichirin, clay charcoal stoves. Today a simple portable burner is often used for table-top cooking. Please try this dish at your home, stays warm everyone; the spring is around the corner! !